Don't miss the most important software for your 3D life - 3DJournal. It was specially developed to help you create 3D images, 3D animations and 3D movies (using two images - the right one and the left one). You can read the description of this software here. And one more important software is 3DJournalDX for creating 3D photos/3D images from any photo/image (2D to 3D conversion). The description is here. You can buy both of them for a good price here. You may see here links to 3D software which may be - in any way - useful for creating of 3D images and 3D movies - and even allows playing of 3D games. You may find here small software utilities which may help you when working in 3D world. You can download the free version of 3DJournal software as well here. 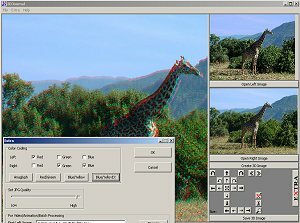 3DJournal - FREE - Czech free version of our tool for creating 3D images/3D photos (using two images - the right one and the left one). Supports batch processing. 3DJournal - FREE - eng - English free version of our tool for creating 3D images/3D photos (using two images - the right one and the left one). Supports batch processing. VCW VicMan's Photo Editor - Useful free graphic editor. 5 MB. 3DJournalDX - FREE - Czech free version of our tool for creating 3D images/3D photos (from usual ones; 2D to 3D conversion). 3DJournalDX - FREE - eng - English free version of our tool for creating 3D images/3D photos (from usual ones; 2D to 3D conversion). You don't have acces rights to this software. Maybe you didn't subscribed it or you aren't logged in. Maybe you were logged out during a long period in which you didn't work with these pages. Links on this page can be connected to pages and files at the server 3DJournal.com and outside this server. Provider of 3DJournal.com is not responsible for content of the pages outside of 3DJournal.com. We are making our best to ensure funkcionality of these links, but it's possible that some of them can be shorttime or longtime out of order. We welcome your notice about problems with a link. Thank you.